When it comes to patient care, the goal for every hospital and health system is to deliver the best possible care. The kind that will lead to the best possible outcome. Yet, such care doesn’t come in a “one-size-fits-all” delivery method. Consequently, each patient is unique, with some having more complex needs than others. This is especially true for advance care planning in end of life care. The key to providing quality care and creating positive patient outcomes is to get everyone on the same page. That’s why it’s important for hospitals/health systems, caregivers, and patients to work together across the care continuum. The challenge, though, is that patient records could be stored in a number of different locations. Similarly, many of these forms are paper-based, which make access more difficult. Such a situation can create errors in treatment and cause unnecessary readmissions, which can lead to unhappy patients. Care Directives’ Advance Directive Information Exchange (ADiE) brings hospitals, caregivers, and patients together to improve the delivery of care. 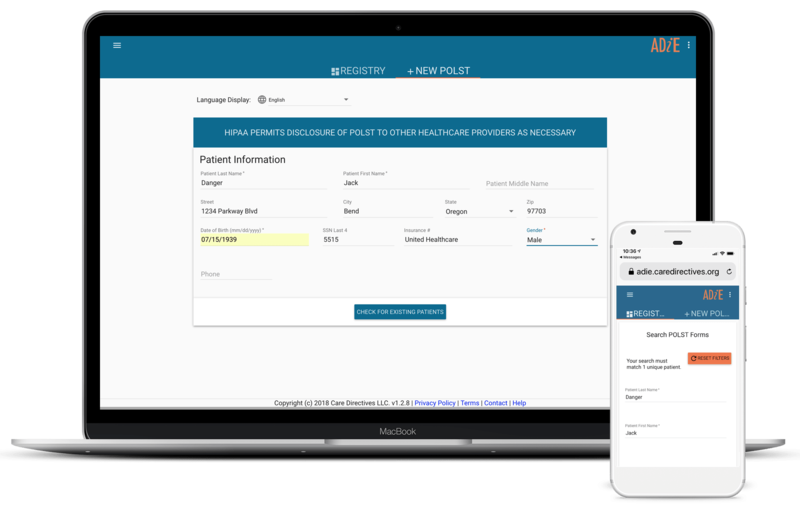 The solution bridges the gap between collecting and connecting advance care planning documents. As a result, it brings together documents from across multiple care delivery systems to improve care. The solutions also provides a centralized location to store patient records and end-of-life care plans without the need for copying, faxing, or scanning. ADiE offers instant access at the point-of-care to the most important advance care planning documents. These documents include forms such as POLST and MOLST forms, ACP forms, and other online medical directives that best represent patients’ wishes.